La improvisación es la piedra de toque del ingenio. How you play a note is just as important as what the note is. 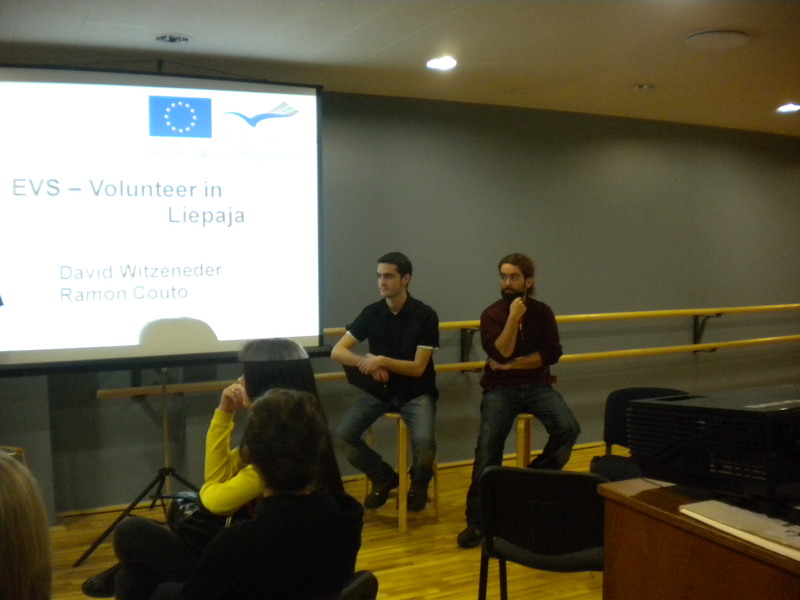 Last Thursday, the 14th of January, David and I have had the opportunity to talk for about forty pupils about our own project, life in Liepaja, experiences in the voluntary work, and especially what it means and how much does the European Voluntary Service we are developing. 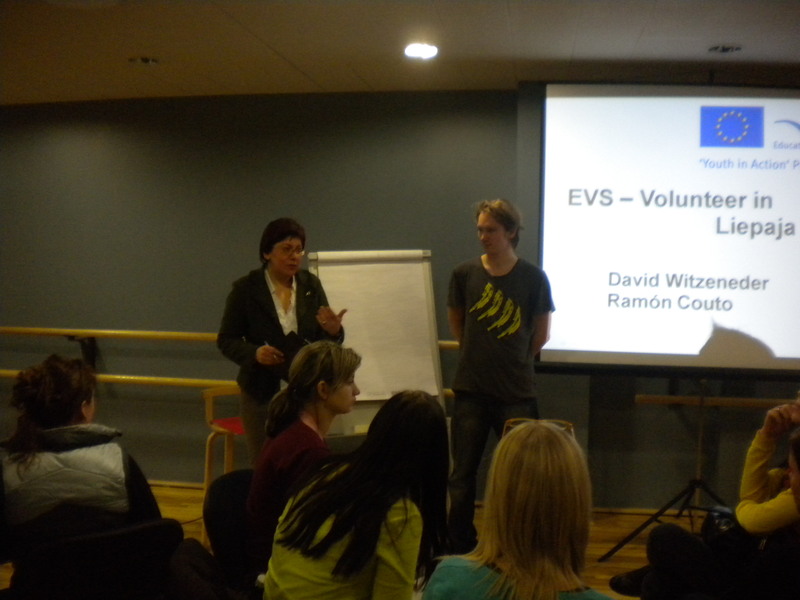 With us also were Oscar and Raimon, two Spanish volunteers from Torrelavega and Barcelona respectively, which also cooperate with the EVS. Raimon works in Lithuania in Kaunas city, and his visit here was more for holydays, to know Liepaja and Riga and maybe see the contrast among both Baltic countries, which in my opinion are quite different. Last November I had the opportunity to visit Kaunas and his project. Óscar is a Spanish volunteer in Latvia working in Sigulda, and he is currently working on a children’s center in the city. He had been for two weeks hosted at our house and participating in all activities of the project, in a collaborative exchange that I also hope to do in the future in other cities. Óscar is a charismatic, funny and outgoing person, always ready for everything. He has hand great to the people and public speaking, and pupils could enjoy the spanish lessons and other activities which himself proposed. So, finally we decided by a majority doesn’t matters about the exposure way, and don’t divide tasks. Without rules and previous structures. A power point and a video of a few minutes are quite sufficient, the rest is a work for the improvisation. Evidently this messed up David, with their efficient work structures, but very stiff for us, and I must say that for the first time after a few exhibitions, I feel David quite nervous before it began the talk… and is more than curious, because he has an innate talent and tranquility to talk in front the audience as few people I know with his age. And finally? I think that it was a success. Like a shared dialogue between us and the public, we start to explain without predetermined order, and speaking extemporaneously, in a natural and relaxed way. Questions from students between the explanation became a entertained and interactive lesson. And we needed to talk for one hour, but finally became almost two hours… evidence that things were going well. Ah! And even the great David was delighted with our pace, of course. Real Spanish way. 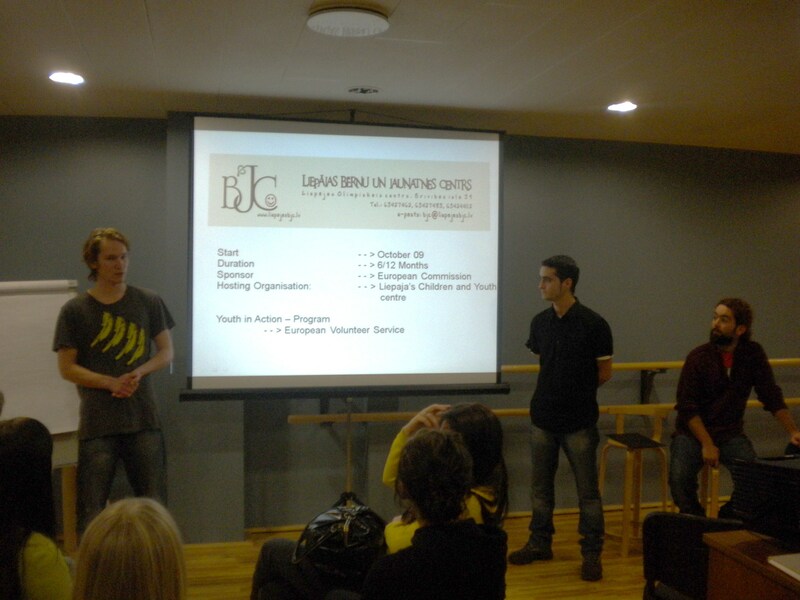 Oscar is a Spanish volunteer in Latvia Sigulda is currently working on a children’s center in the city. He had been two weeks stay at my house with me and participating in all activities of our project in a collaborative exchange that I hope to do in the future in other cities. Oscar is the typical charismatic, funny and outgoing, of those who always “point to a bombing.” Have much power to the people and public speaking, and students were able to enjoy Spanish classes and other activities which he himself proposed. yeah it was really a strange way to present this. without concept, structure and even without a try. However I must exclaim that it works 😀 i would say you cannot learn such stuff out of a book. Y mejor así, en los dos idiomas…..
Para que no olvides : Unha perta, e non collas xeo salvo nun vaso. Bicos dende alén do continente.